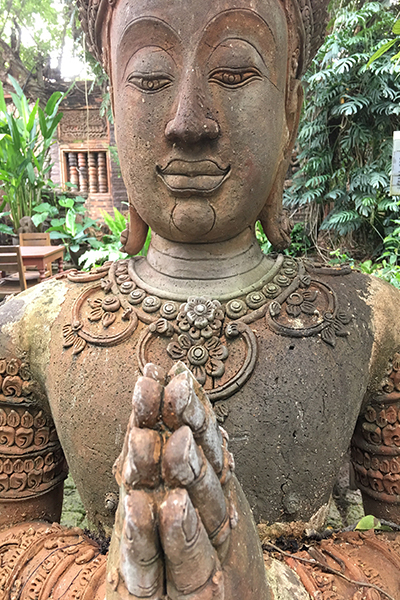 I am sitting in Faces Restaurant (the Clay Studio) in the Old City in Chiang Mai. I’m surrounded by wonderfully aged, moss covered, gnarled walls with carved reliefs and thousands of chards of old pottery. Three-dimensional Buddhas and angels and resplendent guards to touch and enjoy. It’s a terracotta wilderness. It’s the ultimate abode, a haven for those who love to capture time on film. I have arrived for breakfast to enjoy this wonderful atmosphere with a friend who had not been here before. He was stunned an immediately took out his iPhone to recorded the wonders. A huge bowl of tropical fruits arrived with yoghurt, muesli and honey and we attacked it with glee to savour the wonderful tropical array. The cost? $3. There are a number of Thai dishes to choose from too. I enjoy the chicken and green curry. It’s a filling lunch for $6. It has a spiced warmth but you can ask for ‘mai pet’ meaning ‘no spicy heat’, if you don’t like the bite of chilli. I’m in a Zentangle drawing group and we usually like to meet weekly at Fern Forest Cafe situated in the fascinating and fashionable Old City. We like to meet here because it’s redolent of the Old Raj and things long ago. Set in a walled garden with a multitude of hanging ferns and well established tropical trees, here a haze of water is finely sprayed all over to reduce the tropical heat—it works! All tension goes as you relax and chill into this jungle space. The staff emerge from the old white Victorian mansion that is decorated with flowery chinz and cane. I love to have the northern Thai sausage called sai ua with its spicy heat and highly flavoured aromatic rice, garnished with slices of boiled egg. It’s aroi mak mak meaning, in Thai, that it’s delicious. The cost of this is about $10. If we have a heavenly coconut pie to finish off, add $6. A two-course meal with coffee, tea or a fruity smoothie would be close to $20 but well worth it for the culinary delights and ambience. I love this place! I must mention the breakfast dishes are all delicious and tempting too, I usually have the muesli and fruit, it’s a picture on a plate. We feel like an escape into the wilderness, way out of Chiang Mai about a half hour into the real jungle. This is a really special place because it is mostly occupied by Thais and they keep it a secret because the food is fantastic and cheap, the ambience to die for and there is a special treat when you finish your meal. I bring all my visitors here to have a real Thai experience. And everyone loves it, they all return again and again. 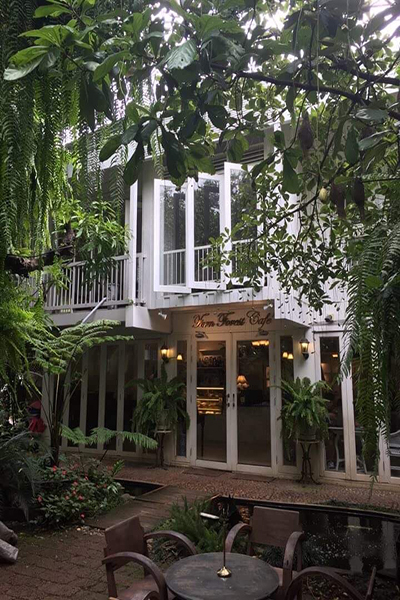 It has a Thai name, Baan Suan Ka Fe, meaning the coffee house in the park or jungle. The menu is quite small but delicious, with lots of spicy curries and for dessert, modern sumptuous cakes. I love the zillion layered cake with a rich creamy dream between each layer. I can taste it now, oh how I want one! The curries cost about $3 and the same for the scrumptious desserts. For $6 you’ll indulge in a delicious Thai feast. 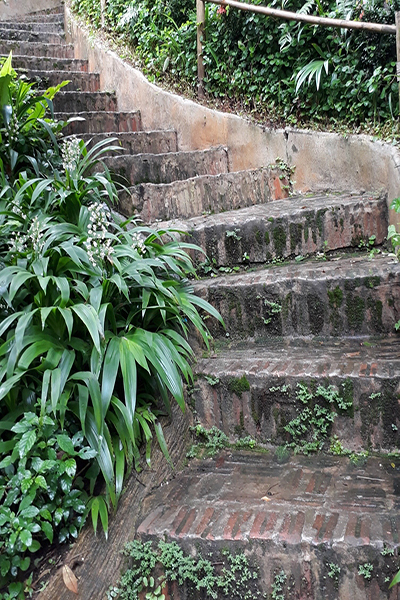 Then you drag your weary and contented body up a flight of steps into the tips of the ferns and trees for a massage. The highly-skilled Thai ladies soothe away every muscle pain you have ever had, your body is stretched and kneaded until a blissful, trance-like state envelopes your body and soul. It’s a sublime feeling…and all for just $10. 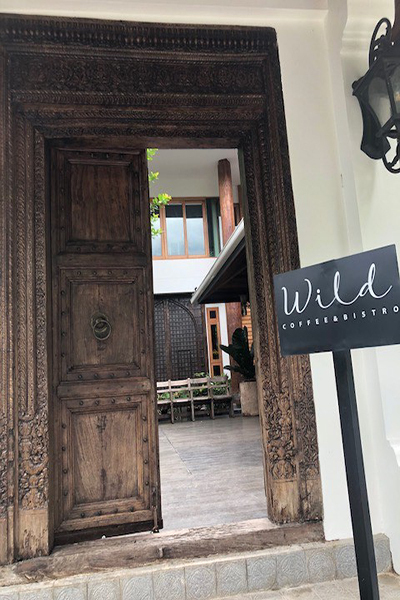 The last restaurant I want you to be aware of is Wild Coffee and Bistro set in the foothills of the Himalayas. Yes, this mountainous range reaches into Thailand. I was amazed and thought it to be quite a romantic notion. We travel to the base of the mountain, about a half an hour from Chiang Mai. It is the rainy season so everything is lush and green. We are surprised to find a rather modern structure but on entering it is a fusion of west and east together. 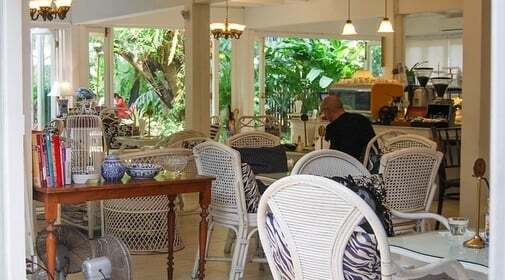 A delightful space with that great green and fern filled leafy feeling you can only experience in tropical lands. Lots of glass so you can look out onto the garden and jungle. It is an incredibly wonderful feeling to be amongst this very green and peaceful place. There is a long terrace smothered in plants of unknown species except they are beautiful and makes you want to have them grow in your home. It has a beautiful homely feeling and you will want to stay forever. You can take the the winding path down past tables and chairs to a waterfall that ripples through the property. It is fresh and clean and you breathe deeply to enjoy the precious unpolluted moment. The menu is small but enough to make good choices. It covers fish, pork, poultry and beef . But beware beef is not as we know it in Australia. I always skip the beef unless it’s minced. I had the chicken biryani which was interesting as it tasted of India but had four delicious Thai sauces you could put with it. The Thais love their hot chili sauces on everything. My friend had a chicken salad which was covered in a variety of edible colourful flowers, leaves, and lettuce. She said it was delicious and aromatic. Most of the dishes were about $10. These are four places that offer good food and an awesome ambience. You can find food for $2 a dish but you never get the true feeling of this exotic land. For a little more you can dine in the most charming places Chiang Mai has to offer. Places that are rich in Lanna culture an have the incredible and amazing tastes of Thailand.